There is safety in numbers, so they tell us. When you are in battle, or attempting to evade predators, that can certainly be true. But, more than safety in numbers (and perhaps as a byproduct of it), there is comfort in numbers. Having a team now staffed at work certainly has made my workday much more comfortable. Not only are there people to share the work, but there are now people to share ideas with. Yet, in order to truly grow, we must take opportunities to venture out alone. This past week, we have attempted to do just that. Anyone who has read this blog for any length of time will know that Noble has a couple of problems. The first is his occasional habit of breaking away – when upset, spooked, or just plain impatient with the proceedings. The second is that he’s rather attached to his herd mates. We have been gradually diminishing the first problem, but due to my accident last year, I could not address the other. I could not risk handling him if he panicked, as he had in the past when away from the other horses. But, the time has come for him to become more independent. For almost two weeks, I’ve been taking Noble out around the property on his own. There is no doubt that he is somewhat nervous. As we lead out from the grooming area, he has been turning to look back at the barn entrance, waiting to see if Java will be following us (as he always does on the way to turnout). It is in those moments that I feel his realization that he is alone, and a slight tightening of his muscles. Yet, he ventures on with me. My focus, at this time, is just to make him comfortable with being out alone. On some days, we simply find a nice patch of grass and hang out. On those days I can watch as his eating goes from rapid and nervous, to relaxed and purposeful – usually about five minutes after we reach the grass. Once he relaxes, I can indulge in my favorite pastime of leaning against his large warm form. By the time we walk back to the barn, for his dinner, he strolls on a loose lead like an old campaigner. On other days, in preparation for our future work, we enter into the arena. On these ventures, relaxation has not yet been fully achieved. He remains a bit on edge, yet largely obedient. The tasks are simple – walk, turns, stop, move over – designed only to get him to focus. On one occasion, Coffee called to him from the back pasture, simultaneously with Java calling him from the barn. It was too much for the young boy, and he turned and bolted to the gate. It was too far for me to keep a hold, so I let go. Upon encountering the closed gate, he immediately turned and walked calmly back to me. It seems that in the absence of other equines, I do offer some comfort. Tonight was a bit different. Once again, calls came from the barn. This time he answered loudly, but made no move to leave. He remained a bit nervous, but was obedient. At the end of the session, I turned him out in the back where Java awaited. He galloped off to meet Java, but then returned to where I was standing. As I walked away, down the length of the arena, he watched and ran from corner to corner, looking for a way to come in and join me. We are just beginning our journey, but this certainly feels like the beginning of a beautiful partnership! The other strides for independence have come from my mother and her little Appaloosa boy. Determined to ride her boy, my mom has been saddling up during the week and climbing aboard. Just working on refining their communication and aids, she’s keeping it to the walk. On Wednesday I left work early, to avoid a known traffic issue. I called to let mom know I was on my way – and she was so excited to report that she had just gotten off of Coffee. She sounded more like a horse-crazy teen as she related the details of the ride on her boy! A friend asked my mom if I worry about her riding when I’m not there. Her answer? “No, she’s just happy that I trust my boy!” She’s right. I’m not a huge advocate of riding alone. Anything can happen, as we both well know. But, she is just doing walk work, and Coffee is an immensely level-headed fellow. She wears her hat, is aware of any problematic activities at our neighbors, and always lets me know when she gets off. There is a point where you accept the risk in order to enjoy life – or else none of us would ever leave our beds! It’s always nice to have someone to help you, but some of the best discoveries come when you venture out on your own and spread your wings a little. 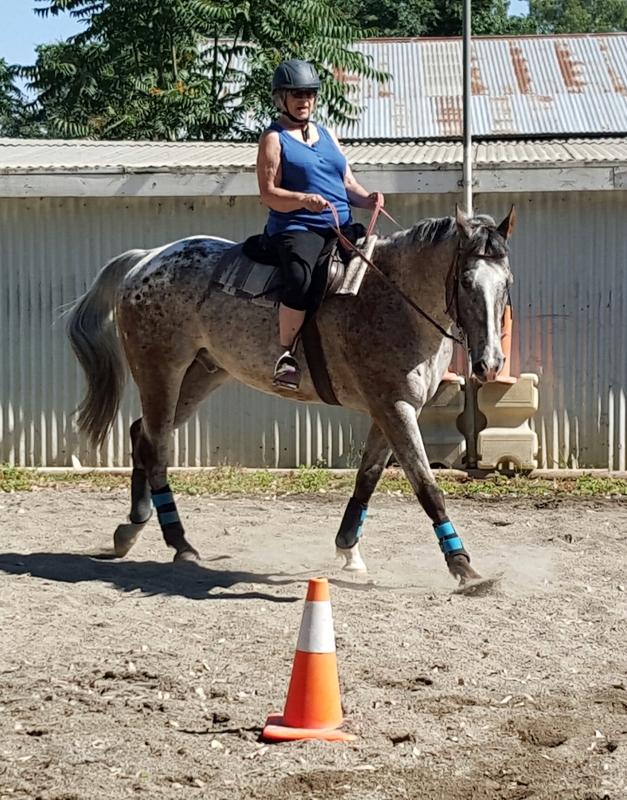 This entry was posted in My Journey and tagged Coffee, experimentation, horse and rider partnership, Horse training, independence, learning, Noble, progress, relationships, riding, security, trust. Bookmark the permalink.